Conveyors are critical. They may not be the machinery slicing product or packaging the food, but when your conveying system goes down and takes your production line with it, the productivity and profits lost aren’t any less costly than if it had been your star piece of equipment. Conveyors don’t require as much time and maintenance as your larger equipment and machines, but a little preventative maintenance—and keeping the right parts in stock—can go a long way. The trend towards slimmer maintenance staffs has left many food manufacturers at a disadvantage when it comes to preventive maintenance and stocking parts. Making sure the bench stock is well-supplied comes far down the list of priorities when there are moving parts that need attention. Even if your conveyor supplier or distributor can expedite the part, they’re most likely fielding several expediting requests each day—meaning you’ve jumped the line for another (albeit shorter) line. Common critical parts can usually be shipped out same-day or next-day, but more complex or custom parts can take four or five days to fabricate. Either way, you’re on the hook for overnight freight and production downtime. Many companies have found a partial solution by using third-party vendors to source parts. At first glance, forgoing a bench stock for the cost savings of third-party vendors who can provide parts as-needed may be appealing. But they may not be able to provide you with OEM parts, and while your main concern is the functioning of your equipment, their main concern is finding the best deal. The convenience may make non-OEM replacements belts, timing belts or bearings tempting, but the costs may be more than you bargained for. A well-made conveyor is designed and manufactured with precision, each part working together for maximum performance. Swapping even one of them out for a generic component can have a detrimental effect on your conveyor’s performance, your warranty, and your bottom line. Non-OEM replacement parts may not only void your original manufacturer’s warranty but also put your equipment at greater risk of damage. A conveyor is only as good as the belt that’s on it. Replacing a belt with one made from different materials—or even just lower quality materials—will take a toll, making your conveyor less effective and difficult to maintain. Most food manufacturers understand the importance of having a bench stock of OEM conveyor parts, but knowing it and implementing it are two different things. It’s a goal that may look difficult, but it doesn’t have to be. Here are a few steps to get you started. 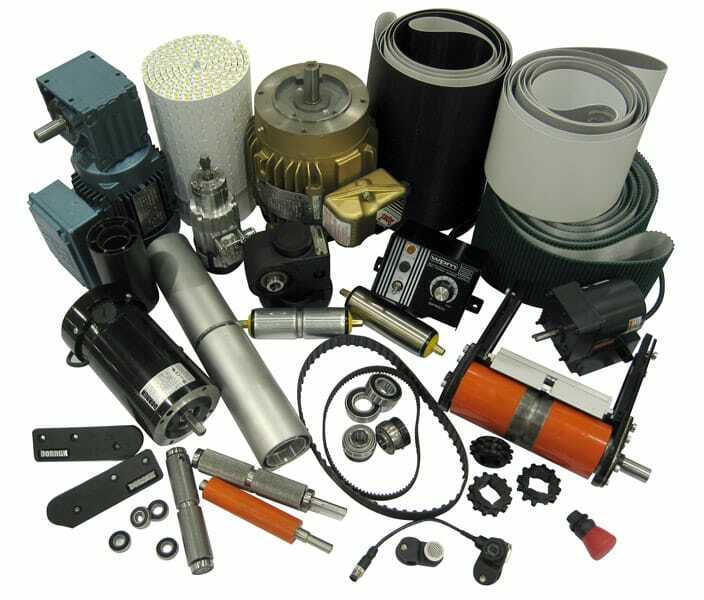 Check the list – Whether you have a custom conveyor or not, conveyor manufacturers often include a list of recommended spare parts with each model. You may be able to order specific kits or bundles for pulleys, belts and other common replacement parts, which having on hand reduces conveyor downtime. Otherwise, stocking one or two of each of the recommended parts is a safe bet. Often conveyor suppliers will help you save replacement time by bundling parts for pulleys and other assemblies together. Get a parts audit – Any reputable conveyor supplier knows there is no one-size-fits-all maintenance solution and will be happy to help with a parts audit, free of charge. Parts specialists may be able to visit your facility to evaluate your conveyor systems, then prepare a recommended parts list and a report of any pending maintenance concerns. Essentially, a parts audit helps you develop a parts plan by streamlining the inspection, repair, and maintenance process for your conveyor system. Educate your staff – How often regular maintenance checkups are scheduled depends upon your volume of production, but both preventive and predictive approaches to maintenance require making sure your maintenance staff—and production line employees—are paying regular attention to conveyor performance. This is another area where your conveyor supplier can help. Along with a parts audit, they can most likely offer you preventative or predictive maintenance training for your staff. Preventative maintenance is structured around the life expectancy of a conveyor’s belts, bearings, gear motors, etc.—a good method, but not always the most cost-effective one. Predictive maintenance builds a maintenance schedule around the actual performance of a conveyor’s various components and replacing them only when they are ready to be replaced. For either approach, it’s crucial that all employees are able to spot signs of wear, such as fraying, damage, a build-up of debris or extra slack in belts and chains and noise or excessive heat from failing gearboxes and bearings. An on-site training can be tailored to your specific equipment and will give your entire staff the knowledge they need to keep your conveyors working at their highest productivity. Establish a bench stock – Even the best-trained staff in the world won’t keep downtime from happening if a common replacement part isn’t there when you need it, so now it’s time to take that list of recommended parts and establish your bench stock. Conveyors have a direct impact on your company’s bottom line, whether simply moving product from one point to another, or working in conjunction with processing or packaging lines. When you are choosing a conveyor manufacturer, don’t just consider the conveyor alone—consider the parts service and maintenance training that comes along with it. They want to help you! After all, keeping your conveyors going doesn’t just help you, it makes them look good, too. Steve Stuff has been the Director of Parts & Service for Dorner Mfg Corp. since 2011. Steve has also held the titles of director of web applications, director of sales support, manager of marketing and international sales, and international sales manager during his 31-year career at Dorner. He can be reached at 800.397.8664 or steve.stuff@dorner.com.